I’m still here, still sewing just slowed down a bit over Christmas. 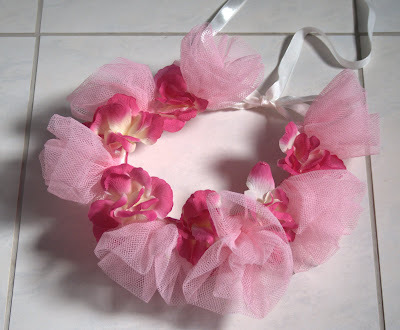 This is the flower circlet headdress I made for one of my nieces, to go with the pink ruffled skirt. I started off with a wire base and covered it with some ribbon (glued on) leaving a trail of ribbon on each end to tie on her head. I made some tulle roses from scrap left over from the skirt and glued these on the base, then pulled apart some artificial silk flowers and glued the petals in the gaps. Here I am trying to model it while taking a photo! 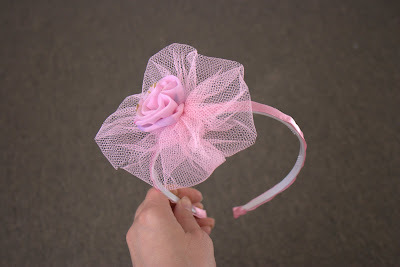 I also made a headband for her to wear when a dress-up one would be inappropriate, like school. 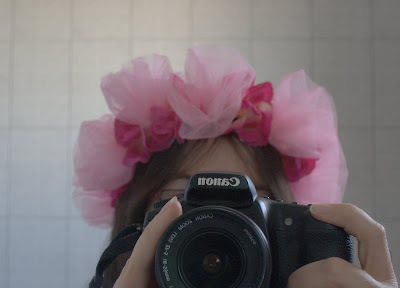 I used a plain plastic band from the $2 shop and glued on a pink ribbon, then a tulle flower and yo-yo made from the skirt fabric. The ribbon is a little crooked as you can see, next time I think I’ll wrap the ribbon around the band rather than try to get it straight!